A new book wallowing in Italia ’90 World Cup nostalgia is reviewed by ERIC BROWN. The 1990 World Cup may not be remembered for quality and excitement but will always be recalled fondly in England. Bobby Robson’s team came closer than any other England outfit since 1966 to actually landing the coveted Jules Rimet trophy. Yes, in Italia ’90 Jules Rimet was still gleaming powerfully for an England team that fell just a cruel deflection and a penalty kick away from the final. What else do we recall ? Well, there were Gazza’s tears for a start. England’s midfield genius Paul Gascoigne set a trend when he realised a semi-final booking against West Germany would keep him out of the final if England got there. Television cameras picked up Gazza sobbing as the semi-final continued and the world took him to their hearts. Gazza made it not only acceptable but fashionable for sportsmen to cry at their lowest moments. Toto Schillaci brought tears of joy from home fans every time he produced scoring heroics. Italians celebrated noisily into the early hours on motor scooters after their team’s latest advance thanks to a Schillaci strike. There was, too, the backdrop of opera served up from Pavarotti and company to often slightly bewildered fans and the haunting tones of Nessun Dorma ringing around cobbled Italian cities. There were less joyful memories, too. Like Argentina’s indisciplined rabble of a team who surely might have won it if they had concentrated on their skills instead of aggression and violence. My own favourite memories concerned David Platt’s amazing volleyed goal from a Gascoigne free kick against Belgium and the incredible stadia. Emerging from a lift at the refurbished San Siro I couldn’t help catching my breath at the first sight of the green postage-stamp sized pitch so far below. And then there was the newly built stadium at Bari which resembled from afar the spaceship in Close Encounters. Oh, and the first class press facilities. All this and more has been revisited by journalist Simon Hart, who has attended the last five World Cups, reports on European football for UEFA’s website and publications and also contributes to The Independent. 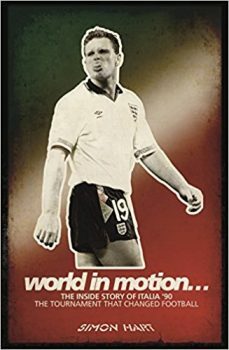 Simon travelled the World conducting a series of interviews with leading figures from Italia ’90 for his book World in Motion, the inside story of Italia ’90. 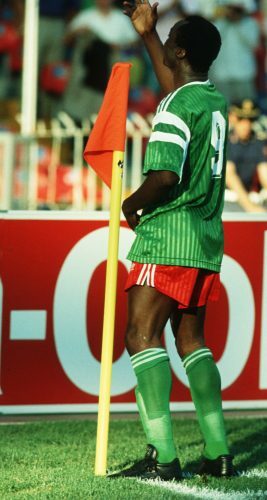 These include Cameroon striker Roger Milla, West Germany’s Jurgen Klinsmann, Sergio Goycochea of Argentina, Ireland’s Packy Bonner and of course Schillaci. It emerged from Simon’s research that Argentina were convinced of a plot to unseat them as World Champions with referees being instructed to favour opponents. Hence, they claim, the reason they had two players suspended from the final and two more sent off during it. Most of us present figured they got off lightly! Italia ’90 produced the highest World Cup attendances since 1970 with an average 48,368 but those fans witnessed the tournament’s lowest ever goals per game ratio of 2.21 despite the efforts of an entertaining Cameroon outfit. Of the 52 fixtures 15 of them finished 1-0. Only two games featured a losing side coming back to win without the aid of penalties. World wide appetite for the World Cup hardly dimmed, though. The global television audience nearly doubled from 1986 with 26.6 billion viewers. In the wake of Italia ’90 several rule changes followed. Red and yellow cards were introduced and goalkeepers were banned from handling back-passes to keep games flowing. Within a couple of years England had founded the Premier League and UEFA re-styled their competitions to include a Champions League which was a European Super League in all but name. Despite all this it’s impossible to forget that chilling moment when Chris Waddle launched his penalty kick against West Germany into the Turin night sky and the World Cup hopes of an England team clearly good enough to win the trophy went with it. World in Motion by Simon Hart will be published by deCoubertin Books on May 10.